It’s hard to make the case that seat belts and bike helmets aren’t effective, or that smoking is good for you. Fortunately, times change, and we grow wiser. Companies constantly replace outdated computers in a process called IT asset disposition (ITAD). A growing thicket of 111 data privacy regulations affecting ITAD must be navigated to dispose of unwanted IT assets safely and securely. Disposal tags do not save lives, but they are the most effective way for a company to safeguard itself against costly mistakes of ITAD. Opponents of seat belts defended their right to engage in reckless behavior. Over time, safety data helped change public sentiment and seat belts became a standard feature in modern vehicles. Today, some still assume disposal tags are not necessary or too costly. With facts and data, however, companies can be convinced that disposal tags must be a standard element of ITAD to eliminate privacy breaches and mitigate the risk of expensive judgments and fines. New research revealed 22% of retired computers cannot be accounted for by serial number. Companies using disposal tags are able to account for 98.4% of their assets – a significant improvement over the average 78% when only serial numbers are used. 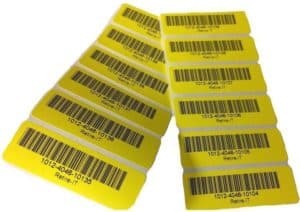 Every ITAD vendor knows that manufacturer serial numbers are NOT reliable for tracking purposes, which is why vendors apply barcoded tags to your equipment when it is received at their facility. If serial numbers were reliable enough, vendors would skip this step. Even with a controlled process within a secured facility, ITAD vendors need barcoded tags to track assets. A need certainly exists to use disposal tags to track assets being shipped to them. There is a reason airlines tag luggage, movers tag boxes, and ITAD vendors tag assets – it works. Tags are a far better way to track assets compared to serial numbers. Without disposal tags, asset managers spend a significant amount of time ‘chasing’ missing assets – it takes an IT asset manager an average of three hours per project to verify custody of retired assets – and this is if everything goes smoothly. When tags are used, assets managers spend significantly less time chasing missing assets because there are far fewer missing assets. Moreover, any missing asset is detected much sooner, so there is a greater chance of it being found. Disposal tags are not only cost-effective, they ultimately save companies money. It only costs about $1 per asset to provide all the protection disposal tag chain-of-custody services offer. Punitive class-action lawsuits are becoming the norm following the disclosure of data breaches and ITAD is becoming a plaintiff lawyer’s dream come true. The biggest risk of ITAD is not data security per se. The biggest risk is related to governance of ITAD. Aggressive plaintiff attorneys are eager to demonstrate that deep-pocketed defendants ignored regulatory requirements and easily-discoverable information makes ITAD a prime target. Disposal tags also deter theft. A significant number of breaches are caused by disgruntled employees. Retired items often disappear before they can be properly disposed of. If somebody knows an item will be missed, he or she will be far less likely to steal it. Opponents of seat belts defended their right to engage in reckless behavior the way opponents of disposal tags defend informal and ineffective practices of ITAD today – emotionally. A sober examination of the facts makes the decision to implement safeguards an easy one. FTC guidance recommends stickers be placed on computers to remind organizations that hard drives must be physically destroyed before disposal. Privacy-minded companies recognize disposal tags not only establish chain-of-custody, but they also help ensure that policies and precautions are followed. Times change. IT asset managers have more to do with precious time than manipulate Excel spreadsheets and needlessly chase missing assets. Senior management should not need to worry about the exposure a company faces if it lacks the reasonable safeguards of a defensible IT disposal process. Disposal tags are easy, low-cost, and an important element in defensible IT disposal.